The company’s history can be traced back to the formation in 1945 of two individual Fife businesses, James Moffat and Sons of Cardenden and Williamson’s of Gauldry, the two joining forces in 1978. George joined the industry in 1976 as a semi skilled mechanic and later as a driver for the Williamson family. He had just completed a three year heavy goods mechanic apprenticeship with Coca Cola and admits to knowing nothing about coaches at that time. In 1981 he left to join Northern Scottish, a subsidiary of the Scottish Transport Group as a driver, based in the Dundee area. He worked there for 26 years through two changes of ownership, culminating in becoming Area Operations Manager for Strathtay Scottish. 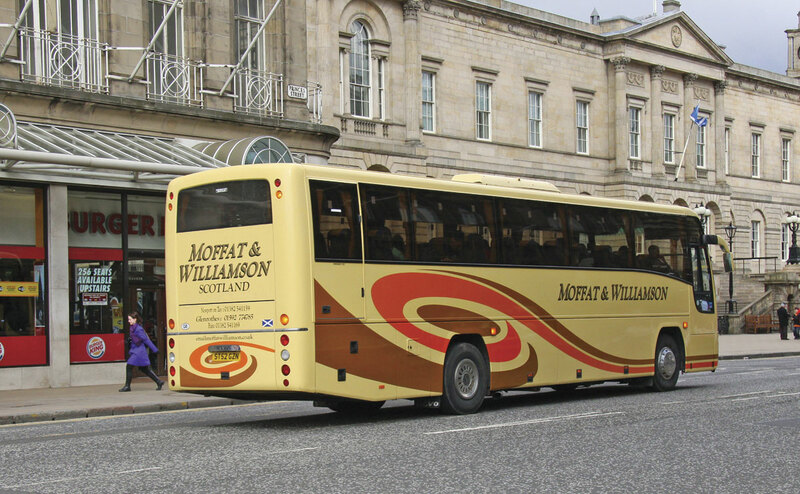 The company was purchased by Stagecoach in 2005 and the following year he moved with them to Aberdeen to become the Area Operations Manager for their Bluebird business. Three years later he was to become their Operations Director. Meanwhile in Fife, Mr Moffat had died and the family sold his share to Williamsons. 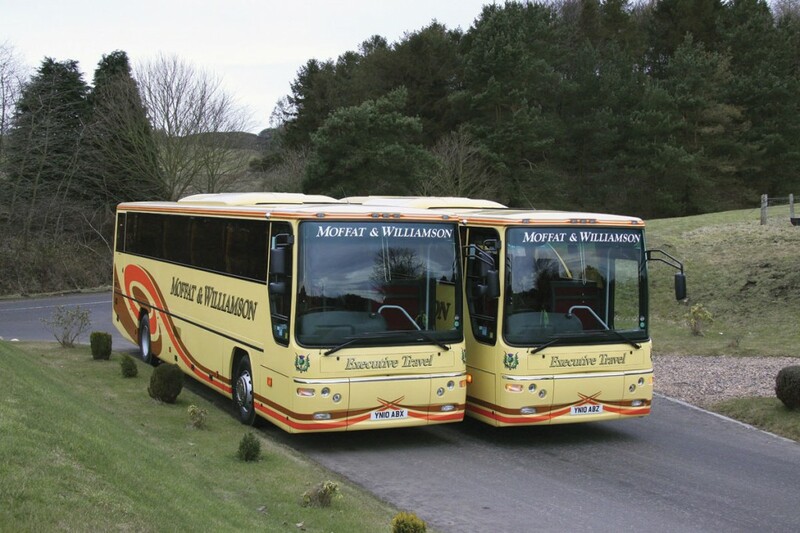 George came back to Moffat and Williamson in 2010 to run the business for the Williamsons, at the request of the owner who was in his eighties at the time. He brought the business from him two years later. 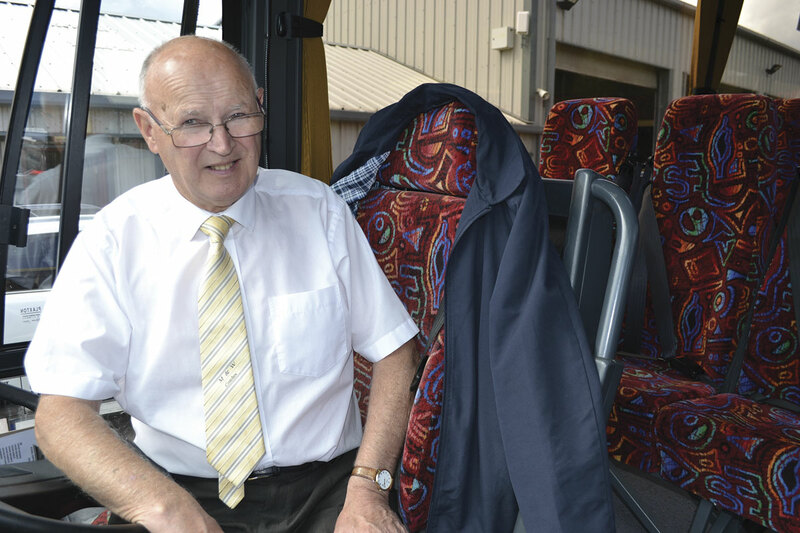 George isn’t unique in the fact that he has had both a bus and coach career but he does believe the grounding that working in both the private and commercial sectors has given him has been invaluable, saying, ‘I would recommend anyone wanting a career in the bus industry to serve in both’. He still drives for the company on a fairly regular basis, as and when required, but has limited himself now to school runs. 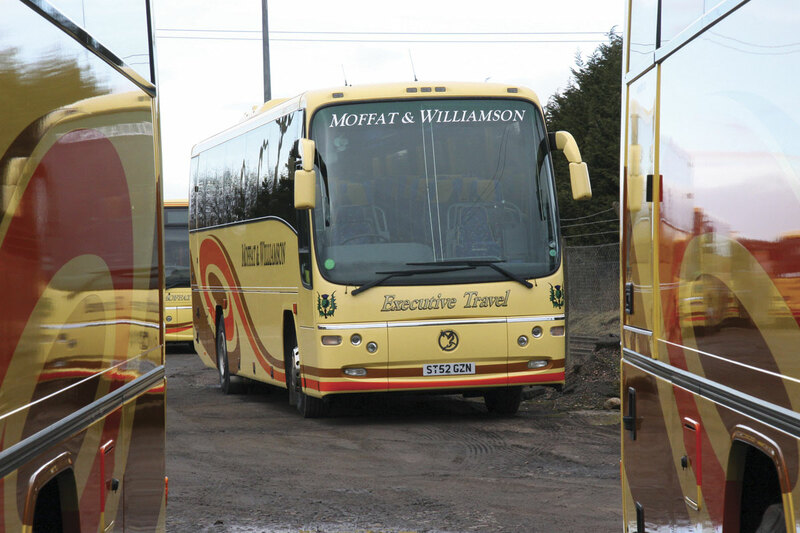 Moffat and Williamson operate in North Fife and cover the Glenrothes area, across to St Andrews and up into Newport and Dundee. These are served by two depots at Glenrothes and St Fort, I visited the latter which is classed as head office. Both sites are pretty much identical in terms of size, number of staff and facilities. 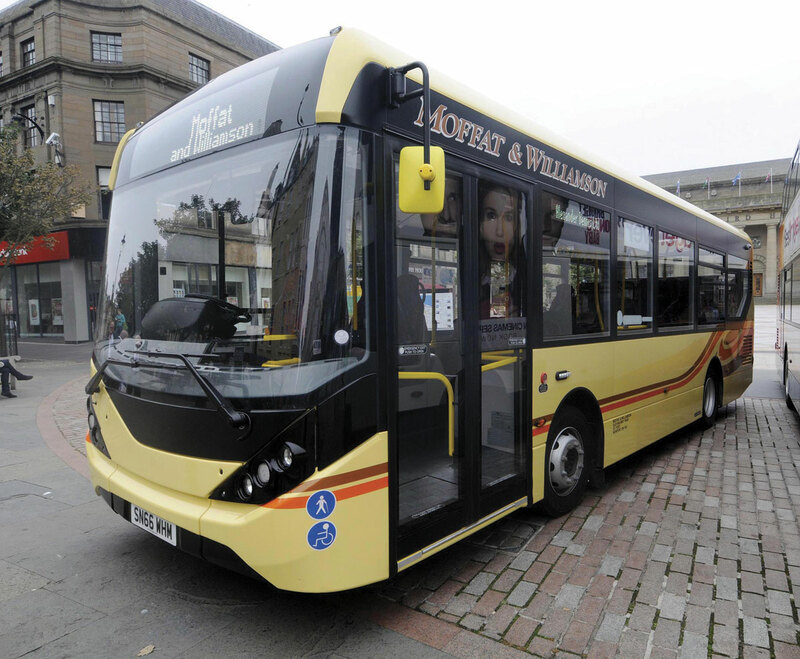 In August 2016, they acquired two new Dundee routes, the 236 which runs from Claverhouse to the city centre and the 88 coastal shopper service from Broughty Ferry, some five miles east of the city. 80% of the business is commercial. The 92 (St Andrews), 236, 88 and part of the 4, which serves the Lodge Rise hospital in Glenrothes, are the only tendered contract work provided by the operator. They also provide 46 school contracts on behalf of Fife and Perth and Kinross Councils. These are registered services as opposed to specific school buses but only operate during school hours. 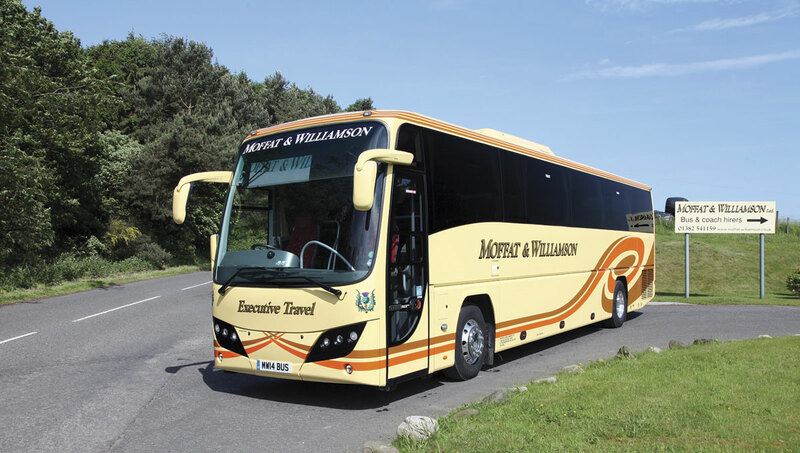 Tour work is a big part of their business and they operate twenty liveried coaches on behalf of tour companies such as Glenton Holidays and David Urquhart Travel, as well as for IBT who specialise in school holiday travel. Much of their tour work is continental travel, which takes up six months of the year from February for skiing trips, through to July. Many school trips to France and Belgium were however cancelled last year as a direct result of the terrorist bombing attacks and this trend may continue in the current year. They don’t run any of their own excursions but they do have a successful private hire business. 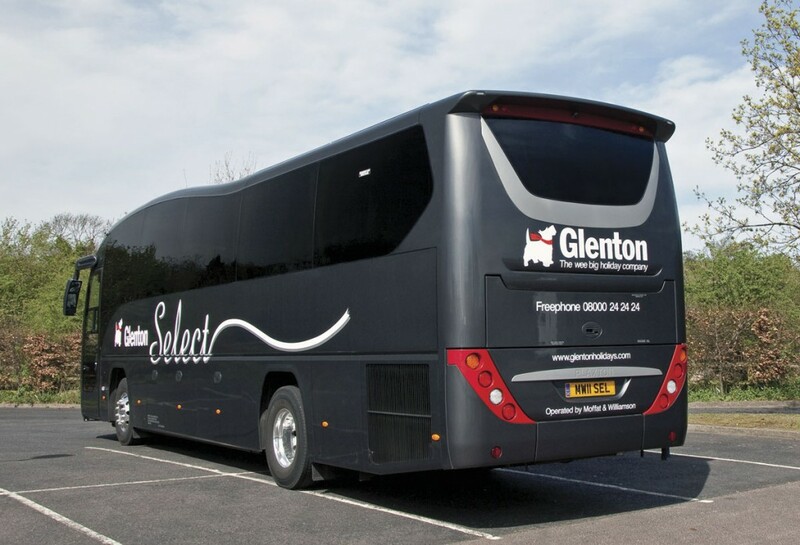 With regards to private hire, they offer the usual services for groups, schools, weddings and sports teams. 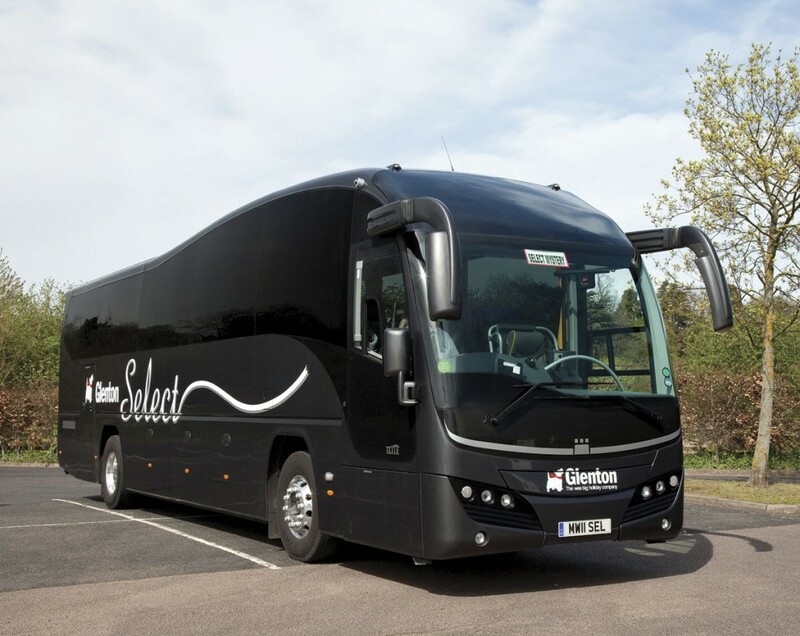 They provide the team coaches for Dundee and Dundee United football clubs, as well as Howe of Fife Rugby Union side and for Dundee High School’s rugby and hockey teams. This regular winter work helps to even out any lulls in the business and much of the company’s success is due to the fact that over 70% of their business on the private hire side is repeat work. Despite competition in the area, there is no shortage of work for them and because of the tour work that they do Monday to Friday, they don’t need to find an abundance of weekend work as many of their drivers will be on rest days. 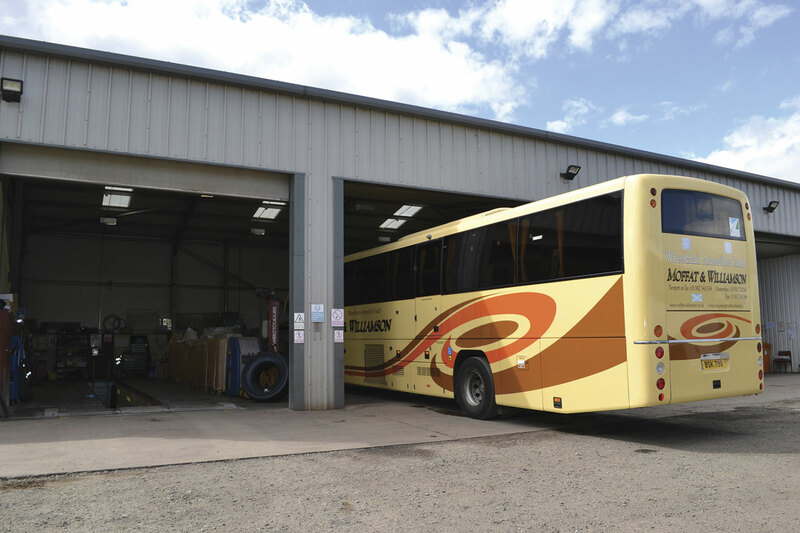 On the bus side, they operate a Dialabus scheme in North Fife on behalf of Fife Council, known as Flexibus, which they won the contract for in 2014. Five minibuses provide this service daily from Monday to Saturday and they acquired five brand new Peugeot Boxers to serve this. George commented that the balance of the business was about right, with the service work complimenting the private work, saying that the company didn’t intend to steer more one way than another. The drivers also tend to be one or the other and the company currently employees 68 drivers out of a total staff of just under 100. Fortunately, driver shortage isn’t too much of an issue for the company. Drivers tend to be loyal and several have been with Moffat and Williamson between 20 and 30 years. George attributes this to the fact that they ‘Look after them’. 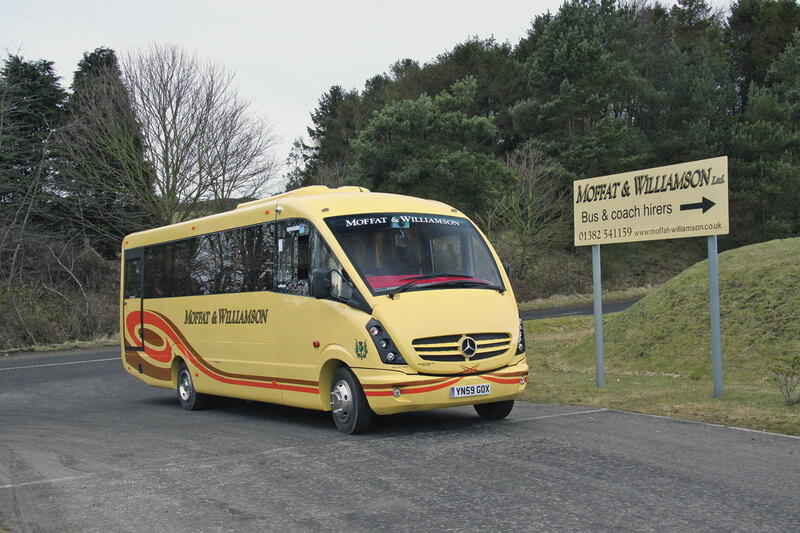 Coach drivers are given company credit cards and fuel cards when away so that they are inconvenienced as little as possible. The company recently paid for two cleaners to be put through their driving test. They use Go Ahead in Livingstone for their driver training and the CPC training is all done in-house. Back in September, they took delivery of seven new Enviro200 MMCs, for their service work. 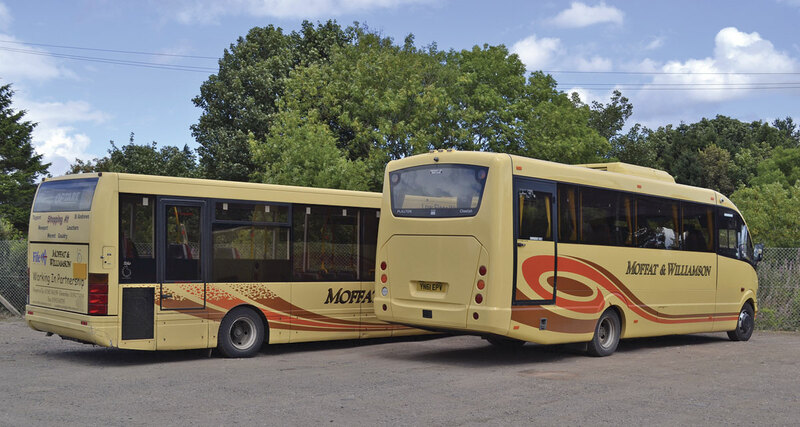 These were to replace their ageing Optare Solos and Dennis Darts, a couple of which were ten years old. George explained that ordinarily, they look to replace two of their oldest vehicles every year with a general rule of thumb being that their school coaches do not exceed fifteen years of age and their service vehicles, no more than ten. The fleet is maintained at both sites between six mechanics. The majority of the maintenance and repair work is done in-house, although the diagnostics work is completed by the manufacturer. They are fortunate that their mechanics are time served and have experience of many of the vehicles. In February they fitted a rolling road at the St Fort site and they are due to install one at Glenrothes. Both sites have pits, vehicle ramps and lifts. Having an ATF facility at either site isn’t financially viable as they don’t have enough vehicles to warrant one and there are currently other testing facilities nearby. In December 2015, the company was struggling with the logistics of providing services which were directly affected by the 23 mile detour enforced by the emergency closure of the Forth Road Bridge. This was just one of a series of road closures on core routes that have provided challenges for the operator and overall this has resulted in a decline in passenger numbers. Their 92 St Andrews service was affected for three months last year because of a road closure at Guardbridge, causing 20-25 minute delays, meaning they couldn’t service Leuchars and the town’s station which is a busy stop for them. As George, is aware, once passengers have got used to using a different mode of transport, it is difficult to get them back, but on this particular service they are pretty much where they were before the closure. George attributes this mostly to the fact that they are the only direct service from Gauldry to St. Andrews and although there are alternative routes, they require changing buses. The company supplies every driver with a mobile phone and if they are running more than five minutes late, they are required to ring the office and advise. As of yet, they don’t provide real time information, simply because it isn’t available in the area yet, but this is something that George is in early discussions about. All bar one of the routes are rural and this challenge is not unique among many independent operators. Restructuring of routes to make them more financially viable is an ongoing task but George isn’t aware of the company having to withdraw a service. With such a high percentage of senior passengers, the services provide vital transport to many people. Fortunately, the concessionary fare reimbursement is higher than in England at 56.9p. Many of the services have long journey times and are over twenty miles in length. One of them, the 92, is a 44 mile round trip and so keeping within their 10% service level agreement for punctuality can prove testing. In September they introduced a new Ticketer ticketing system onto all of their service fleet, which has the capabilities to provide RTPI in the future, should they choose to go down that route. It offers GPS live vehicle tracking and it feeds back the types of tickets being purchased as they happen. The obvious advantage of the live vehicle tracking is that if a vehicle is held up, another vehicle can be sent out to pick up the service. This is the ‘luxury’ they have, as George explained, having two depots. Providing a service is running no more than fifteen minutes late, another driver can be sent out. The system will allow them to communicate directly with the drivers and will eventually phase out the need for mobile phones for drivers on certain routes. Although the £58k investment for the new ticket machines seems like a big outlay for an independent operator, George assured me that his old system was about ready for renewal anyway and that their intentions are to continue to provide service buses for many years to come. Most of the fleet is fitted with CCTV, with cameras fitted both inside and out and this has proven to be invaluable to the business when living in what George describes as a ‘compensation culture’. The installation has saved the company thousands of pounds and George isn’t afraid to challenge an insurance company who wants to pay out because ‘it’s easier’, when he knows the claim is fraudulent or unfounded. Conversely, although the company have embraced this new technology, this won’t replace the ‘mystery shopper’ that George introduced when he took over the business. This incognito passenger will go out at least twice a week and covers the entire network, regardless of whether it’s 6am, midnight, or a weekend. A report is filed each week and there is a comprehensive tick list of criteria that needs checking, including timing of the service, presentation of the vehicle, driver attitude and even goes to specifics such as whether the correct uniform is being worn and use of mobile whilst driving. As well as reporting on the specific routes that were ridden, the undercover inspector will also spend a considerable amount of time at key bus stations checking several services throughout the day. George explained that the advantage of a mystery shopper over computer data is that it gives you a human aspect. Because they ride the services they get to interact with passengers and hear what they are saying about services, such as the driver was rude or the vehicle was cold; things that would be much more difficult to pick up without playing back the entire day’s CCTV footage, which incidentally doesn’t have audio. They report back on incidents as they happen and have proven invaluable in a number of cases. The introduction of the new Ticketer system is part of a Transport for Scotland initiative and one of the reasons for the company introducing it was a new multi operator ticketing scheme that it is involved in. Following the successful introduction early in 2016 of the GrassHOPPER in Aberdeen, Scotland’s first multi operator smart ticket, Dundee were quick to follow. 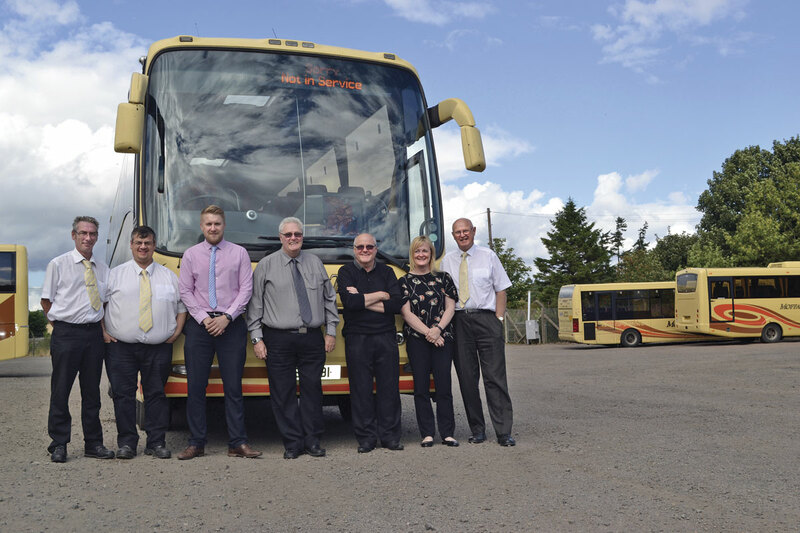 Moffat and Williamson joined forces with National Express Xplore Dundee and Stagecoach East Scotland, in conjunction with Dundee and Angus Council, back in September 2016, to introduce the ABC, All Bus Company smart ticket. 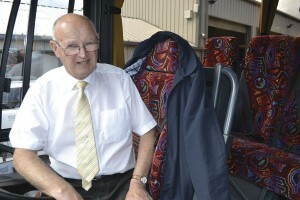 George explained that it was important that having successfully won contracts in Dundee, that they were able to offer a comparable service to the two main operators and that their passengers could receive a seamless travel experience by stepping from one bus onto another without the inconvenience of having to purchase another ticket. He said that the system was already three quarters of the way there and that by Moffat and Williamson winning the contracts, it was able to be finalised with them on board. ABC is valid throughout Dundee and the surrounding area and each participating operator has their own version of the smart card with their logo on it. As well as being available to use as multi operator single fare ticket, each operator can use it to load their own daily, weekly or monthly fares and this is something Moffat and Williamson will eventually introduce. Currently they have individual route fares but they do offer discount for frequent travellers. They will be prepared, should the service be implemented in other areas. George anticipates that it will be rolled out across Scotland eventually and the company is ready for its introduction throughout Fife, should it occur. He said he was delighted to be part of the initiative as it shows the importance of the smaller operator within the bus industry as a whole. The company has no tenders pending for 2017, although the Flexibus contracts will come up for renewal in 2018. Although his wife and son are directors in the company, there isn’t a natural successor and George certainly doesn’t have any immediate plans to retire. That said, until the birth of his first grandaughter, Mia, in the summer, George hadn’t given much thought to retiring at all, but now he wants to spend more time with her and he is training people to succeed him so that eventually he can concentrate on being a grandad!